The Cobb grill (Buy on Amazon) has been repeatedly praised as one of the most unique and versatile portable grills on the market. This unit will run on eight charcoal briquettes for up to three hours, will never flare-up, and can cook a whole chicken as easily as burgers. Lightweight, easy to light and operate, this grill is perfect for virtually every outing. It doesn't even get hot on the exterior so you can pick it up while cooking to move it. The only real drawback is the relatively small size. The cooking area is a little under 12 inches and doesn't give you a lot of space. Other than that this is a great little grill. 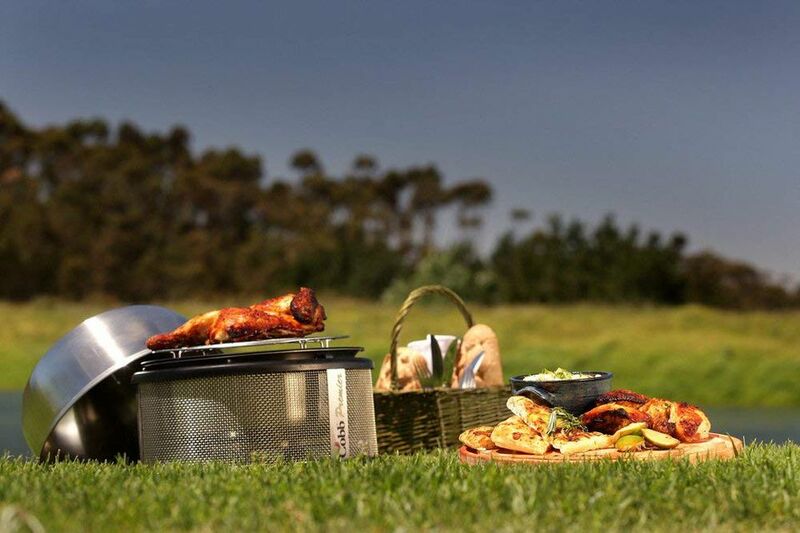 The Cobb really is one of the most versatile portable charcoal grills on the market. This little unit can run for hours on a handful of charcoal briquettes and cook a wide range of foods from burgers to whole chickens to omelets (roasting rack and griddle not standard). Weighing in under 9 pounds this lightweight unit is perfect for a wide range of portable applications since it can be picked and moved hot (the exterior doesn't heat up). While the size is very small (three to four burgers at a time) this unit is very easy to use and virtually foolproof. You really can put a chicken on to roast and come back in an hour to check on it. Because of the excellent grease management system that collects grease away from the flame, flare-ups are virtually impossible. This is a great little unit for campers, boaters, and tailgaters who don't need to prepare a lot of food but want the versatility and near foolproof cooking this unit has to offer. While the additional accessories (woks, smoker box, skillets, griddles, etc.) add a lot of features these will add a lot to the units overall price.